Stars, queers, friends and fabolousities! We invite you to celebrate with us the Joy of being Queer by joining our queens, kings and kvirs at the 3rd edition of the DragQueerShow! Not only can you enjoy a wonderful show, but actually perform with us! It’s an open mic event where everybody who does not follow or identify with a “straight” line, everybody who welcomes a state of disorientation and/or radical feminism can bring their song and join us on stage. All who are interested in developing their own Drag Queer personas and prepare for the show join us earlier in Godor. We will share our skills in making beards or/and chest-hair, eye-makeup, etc…and work towards developing our own fabulous Drag Queer performances. 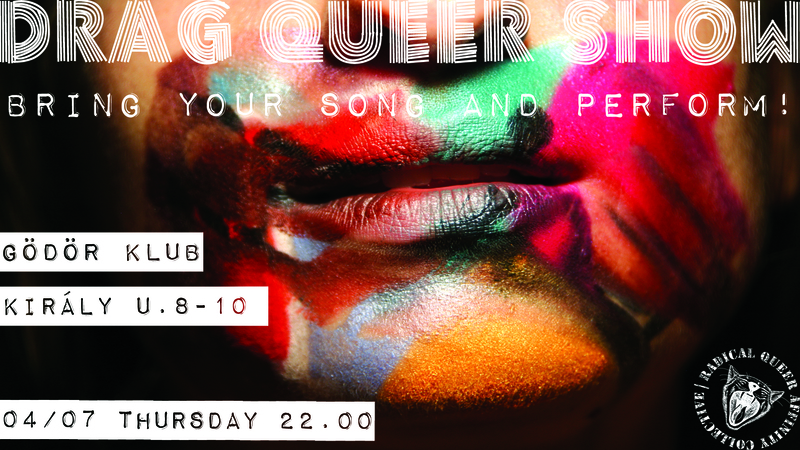 :: 10 pm – 11.30 pm DRAG QUEER SHOW! :: 11.30 pm Afterparty with DJane Yinna and DJ Andropauza will burn the dancefloor!